No photo today....my computer took a permanent vacation and took my photos along. I have issued a missing photos report, hopefully they will be found soon. Got a new PC and am having to relearn everything. I am a slow learner, please forgive the delays. What a privilege to be asked to participate in the Kalmbach Bead Soup Party. The wonderful people of Bead World in Glendale AZ. furnished the beads for the challenge. 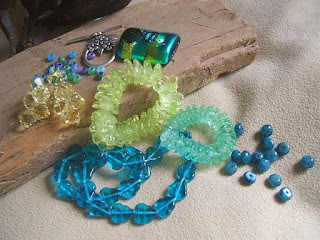 All this inspired by the originator of Bead Soup, Lori Anderson who just wrote a book on some of the bead soup challenges, published by Kalmbach Publishing Co. 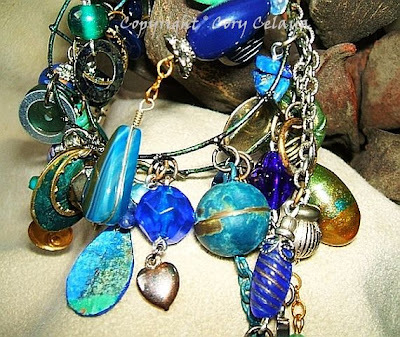 The necklace titled MIDNIGHT RAIN was inspired by a water fountain in front of my friend Gail's apartment. She loves and collects my jewelry as much as she loves her peaceful water fountain. 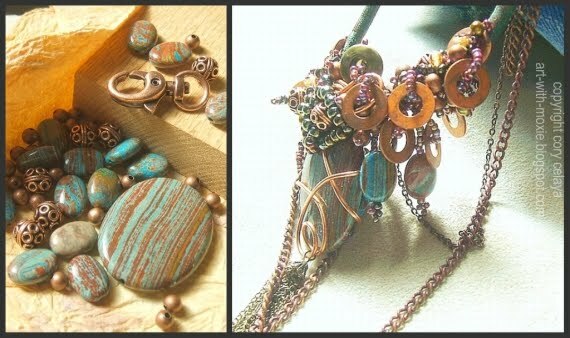 I intuitively gathered items to add to the beads and among these were black fibers, warm brass beads, and vintage chain. The only thing I wanted, was to keep the necklace fluid. 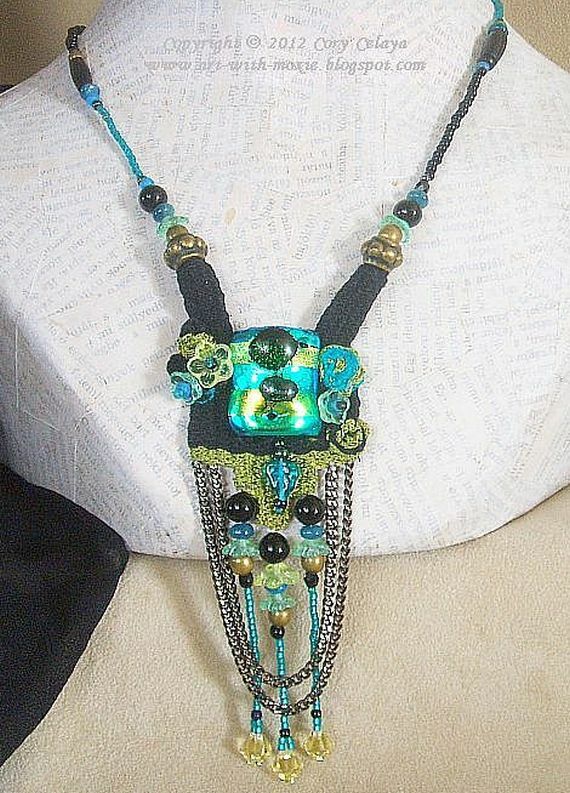 I started with a free form needle woven base to which I added the fused glass focal, beads to mimic flowers in the garden and the fluid chains and dangles. I love the colors and textures of the beads and the beautiful small fused glass focal. I will admit that because I am an intuitive designer, the palette will more than likely change, and change it did, with the addition of the black fiber on the necklace. I went with it, thus the name Midnight Rain. Not so much on the cuff, the palette pretty much remained true to form. Thank you to everyone who contributed to this creation. 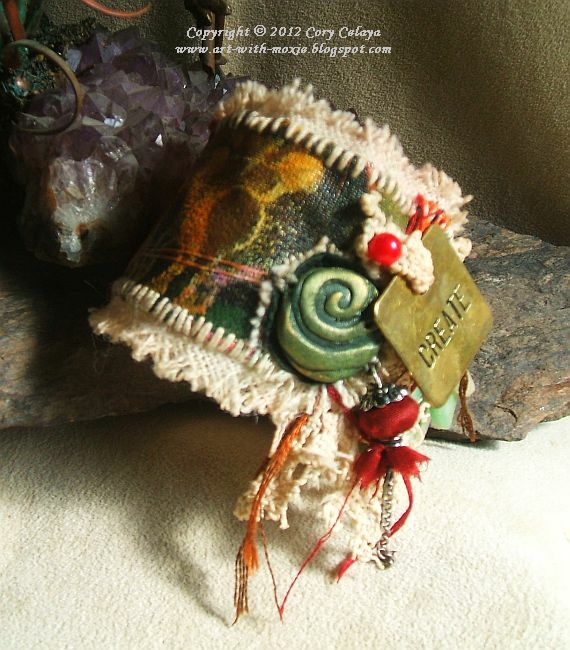 Scraps of Paper Leather were used to create a wide cuff. 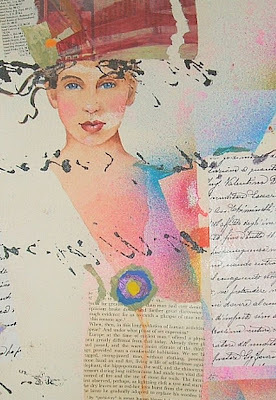 I wanted to create an extra sample of work as inspiration for the students in Tucson. Everyone made a lovely sheet of paper leather, and each had a choice of either making a cuff, a wall hanging, or use it to create a journal cover. The cuff that I made has stained antique lace, paper leather, a fabric bead, a faux jade charm, a polymer clay motif, and 2 brass pieces, one stamped with the word CREATE and the other with the word ART. Visit Create With Moxie to see my latest artwork on paper. As I mentioned on my painting website, I apologize for the long absence. You can read about it here. I have been doing very little for several months, I kind of crawled in bed and covered my head. But I can not stay there forever so I have been trying to do some painting samples for my classes, as well as catching up on my art jewelry. 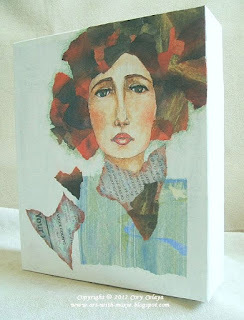 I will be teaching a class in Tucson for Paperworks, and need to replenish my inventory. The above Boho Bangles are a spontaneous mix of color and texture. Easy to mix or match with other bracelets and cuffs. Look for other designs on my etsy shop. 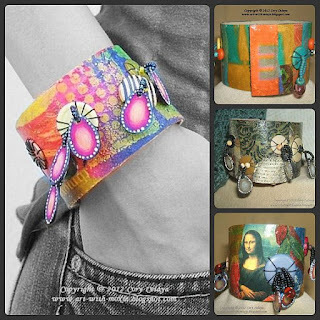 Bangles.....wide ones, skinny ones, in between ones, and in colors of the rainbow. A total mix of colors, textures, and patterns. Most made from the left over demonstration pieces of Paper Leather that I taught at Art Unraveled. 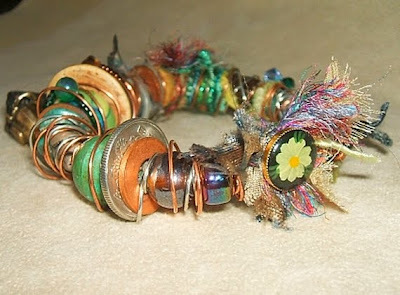 They look great mixed and stacked with other pieces of jewelry. See more bangles soon on Moxie Gallery my Etsy store. In keeping with the Bead Soup Challenge, and because I like to work in series, I have created two more similar designed necklaces, both of which will be available for purchase. 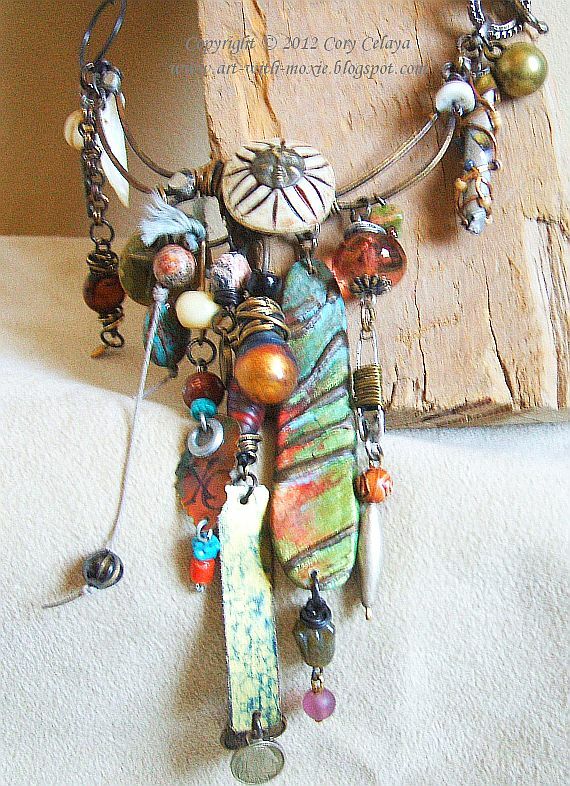 This necklace has some hand painted charms, a hand made resin bead, a beaded aluminum bead, a shell charm, beads from the orphan bead box, and other items from the "stuff" box. 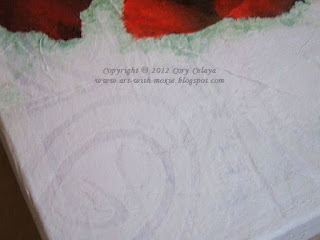 A NEW PAINTING HAS BEEN POSTED ON CREATE WITH MOXIE. I will be posting most of my 2D art work on Create With Moxie and my Jewelry designs on this site. bold statement with the small beautiful heart? I placed the ingredients in the hands of my muse, and allowed my intuition to take over. I constructed a wire and clay base. I added a hand painted textured button to bring the eye to the area of the heart pendant which was now suspended by a delicate chain. I continued to add various charms to create texture and volume. 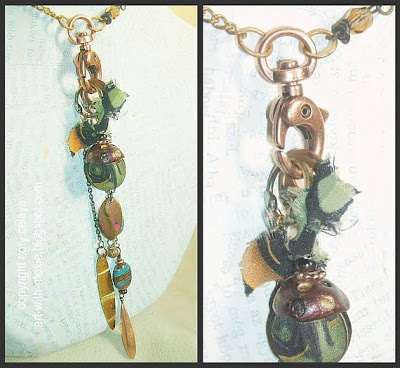 This included a copper colored faux resin bead to pick up the color of the copper wire clasp which I separated and placed one on each side as they became charms. Among the charms are, a mother of pearl shell that a student brought for me from the beaches of New Zealand, a tassel made from silks that came with me from teaching in Japan, handcrafted and painted fabric beads from my line of beads called Modern Acorns, and a bunch of other favorite orphaned beads. I added two sizes of round wire circles to repeat the round shape of the button. 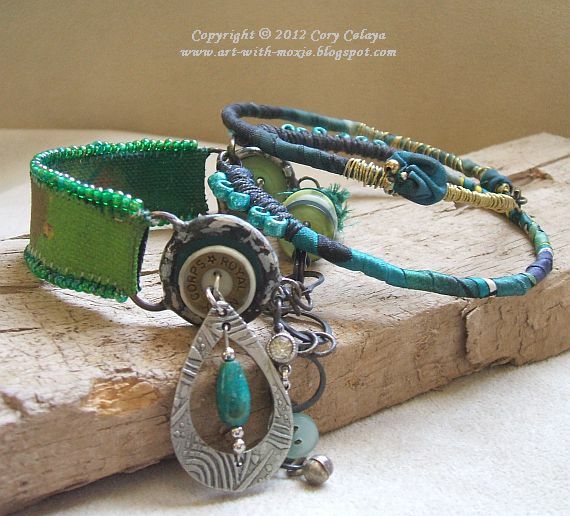 The lovely beads that Cheryl sent are attached to the wire circles and a small patinated brass clasp holds everything in place. All in all I am very happy with the end result. My muse presented me with bursts of inspiration and improvisatory moments where I added, subtracted, shifted, broke apart, and melted together most of the ingredients. Please visit Cheryl's website to see the beautiful necklace that she created with the ingredients that I sent to her. Thanks Cheryl for being my partner and for the wonderful ingredients you sent me. Click this link to visit the other participants of the first reveal. 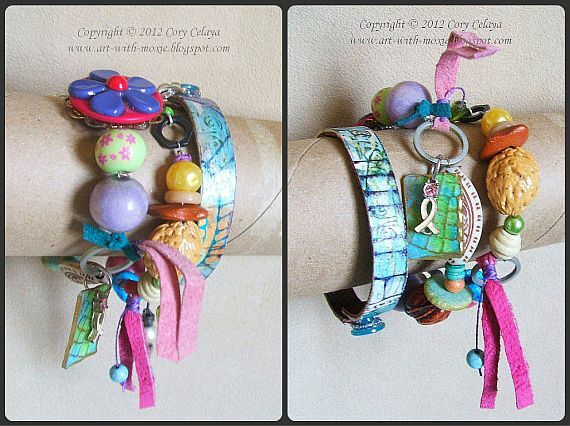 A big thank you to Lori Anderson, a beautiful jewelry artist, for creating this wonderful challenge. I would like to invite you to paint with me. I will be teaching Mixed Media Classes at Hobby Lobby in Peoria and Avondale, Arizona starting in September. Peoria classes will be Mixed Media Painting and Collage on Monday afternoons. 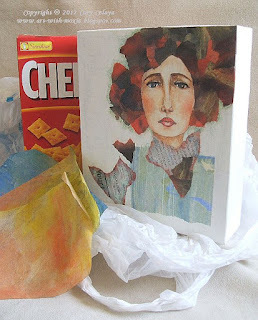 Avondale classes will be Mixed Media Painting and Collage and also classes in Unique Jewelry Design held on Wednesdays and Thursdays. I will be posting class information on my other website soon. Click here for information. Seating is limited, so reserve your space early. Comment on this post or email me if you are interested in reserving a space. All levels welcome. Hobby Lobby Arrowhead in Peoria AZ, August 18, 2012 from 1 to 3 pm. 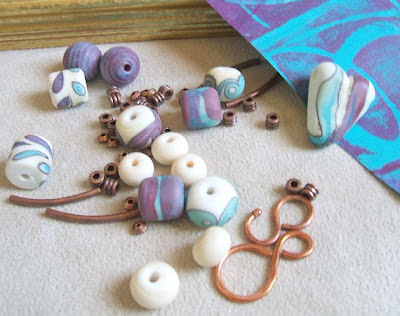 These are the lovely Bead Soup ingredients that I received from my partner Cheryl Roe, thanks Cheryl, I love the Southwest colors, but you threw me a curve with the white beads, I rarely work with stark white, the fear of the blank canvas, I presume. But... this is the fun of the challenge. 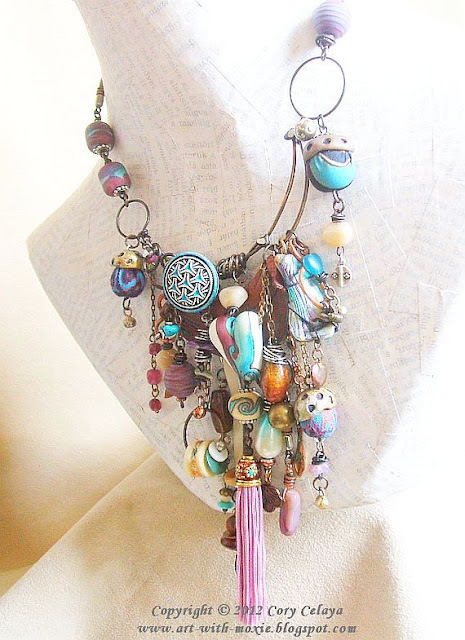 I love, love, love, the simple designs on the beads and pendant. Feels like they have been painted in watercolor. I so wish that the pendant was larger, here again, another challenge. 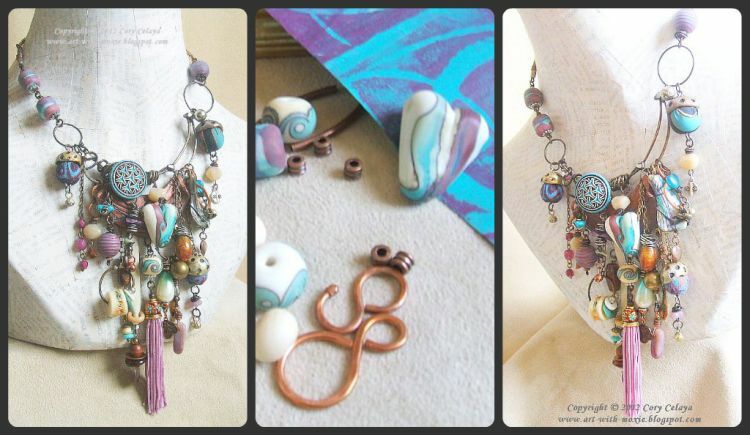 Please visit Cheryl's website, she makes lovely beads and jewelry. I would also like to thank Lori Anderson for partnering me with Cheryl. The heat is unbearable, so I am staying indoors making hot jewelry. Art Unraveled is just around the corner, so I am making more samples of what can be made with the Paper Leather Fabric which I will be teaching. 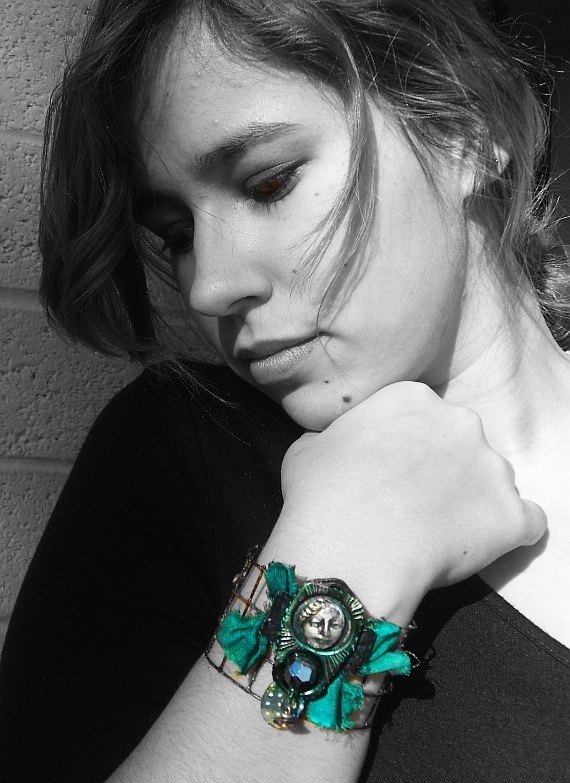 The bracelets look great stacked with other simply made bangles in mix or match colors. These samples will be available for purchase, please stop by and take a look. Don't forget to drink lots of water and try to stay indoors. As I was ripping the news paper, I randomly ended up with two heart shaped pieces, one which reads "do you find yourself unable to do the things you love to do?" and the other, which you see in the first photo, reads, "your voice counts". I took this as a sign, telling me to get out of the funk I have been in lately and paint. 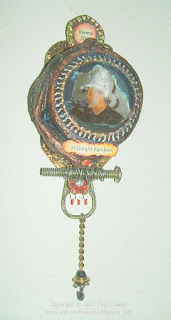 The background is white on white, the face is painted in watercolor, and I attached a hanging wire to the backside. Art Unraveled 2012 is almost here...how time flies. I will be teaching a class on Paper Leather and here are some cuffs that will be available for inspiration. If time permits, we will start a cuff in class, nonetheless, I will walk you through the process. Paper Leather is great for journal covers, wall hangings, and purses. These items will also be available in class to inspire you. I finally finished some necklaces. In the last three months while my brother was hospitalized, I would come home exhausted but could not sleep. I found a thrift store garment that had heart patterns which I cut up and I started filling in the shapes with embroidery. 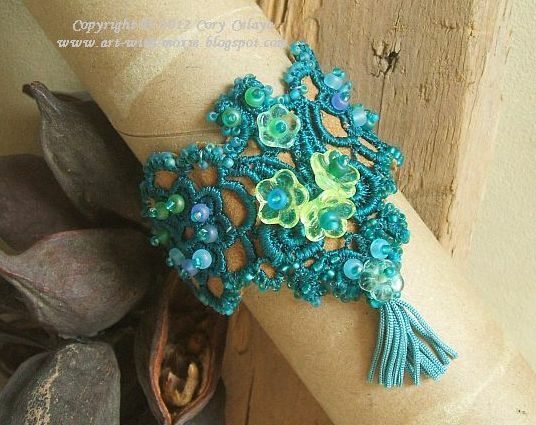 I randomly added one seed bead at a time, a sort of meditation for me.. I also added a metal reliquia of Saint Margaret and finished the necklace with recycled beads. Eight days now since by brother passed. I would like to say thank you to all the wonderful people who sent prayers, cards, and calls. Today I said farewell to my only brother, David Rivero. David was a singer and songwriter in love with country music. Not having had one music lesson in his life, he picked up a guitar one day, and just started playing, following the footsteps of our father. His children now do the same. He went on to write music, my favorite being "Midnight Rainbow". That song among many, went to the top of the hit lists in Europe. His music will live on, being that his songs have been contracted and will be sung by other artists. He left behind a CD of songs called "Blood Line" in reference to our life journey. He was honored with an award from the Arizona Writers Association for a song called "The Look", which we will hopefully see on the music charts soon. I love you "mijo" and I will miss you so much. Sorry about the delay in posting...beside teaching in Ohio for Artiscape, I have been super busy and stressed over my only brother who has been in and out of the hospital. He is very ill and in need of prayers. The above photo has a hand painted flower motif on porcelain, embellished with a textured and colored piece of copper, and... a little fat bumble bee. If you are intrested in classes, please visit here. Finally able to get into my photos, had to change everything...hope this never happens to you. The above cuff is adorned with beads, charms, and handcrafted resin beads... and yes, a copyright watermark, I do hope it is not a distraction. Sorry for not posting lately. Someone hacked into my photo folders and I have not been able to post any pictures anywhere. Hopefully it will be cleared soon, Thanks for being patient. The soup is done... time to enjoy. The beads below are the one's Rhea sent to me. I loved everything about the beads, especially the color combination. After admiring them for a day or two, I started on an idea. Very quickly I discovered that the hole of the focal bead was closed. No, Rhea did not do this on purpose. It did however, set up a real challenge. I tried a bead reamer...nothing, I was afraid I might crack the bead. 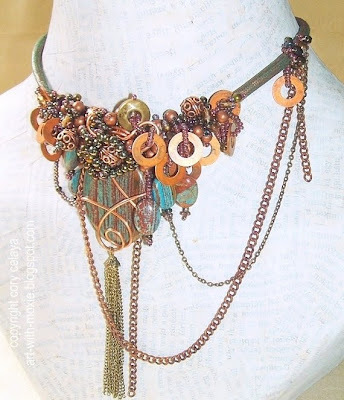 So, I called on my muse, and she handed me wire, she handed me more beads, chain, and copper washers. I Started working intuitively and this is the result. It was a miracle the way things fell into place, hence the name, "El Milagro". Thank you Rhea for not checking the hole before sending it, I'm glad that it was closed...I don't believe in coincidences. Now, go check out Rhea's blog, her soup is yummy. Next go visit Lori, where you will find links to all the other participates. These are the beads that Rhea sent to me. On the right is a side view of El Milagro. 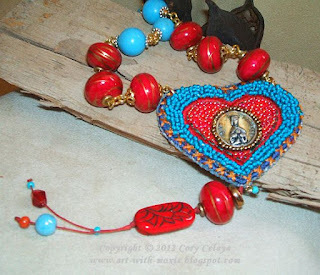 Had I executed my first idea, I probably would have used the lovely clasp, but, it was to heavy to use on El Milagro. So I made a simple long necklace, using the clasp as a focal on which to attach the dangles. 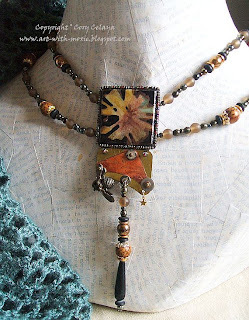 I also added a caped bead, handcrafted by me from my line of fabric beads called Modern Acorns. Yes, the beads will be posted on Etsy very soon. I do hope you enjoy all of the different soups. A big thank you to Lori Anderson for giving us this wonderful challenge to play with. This Mixed Media Workshop is all about play, with lots of demonstrations and student teacher interaction. 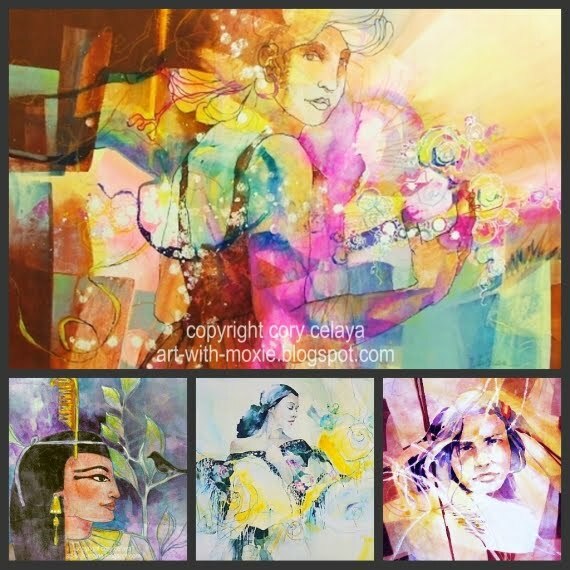 By the fourth day, everyone should have a finished or near finished piece of original art. Hope you and your friends will join us for fun, for learning, for sharing, and making new friends. Great class for the novice painter or the seasoned artist. An on going class. Must attend all four classes. Time: 9 am to 4 pm with a lunch break. Corner of Western Ave. and Central Ave.
for fee information, directions, and supply list. is of my granddaughter Alisha. More of Cory's art here. First I would like to thank ART LEAGUE WEST for asking me to do a critique and demonstration for their members. 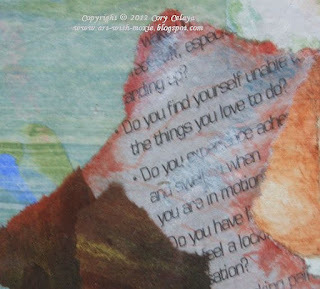 I will be teaching a workshop in mixed media called FREE PLAY in March 2012. (exact dates are being processed) The classes will be held in Avondale, Az. Artists are invited, non members included, to attend the four separate 5 hour workshops. Demonstrations will be given on how to gather, alter, prepare, combine surfaces and techniques. 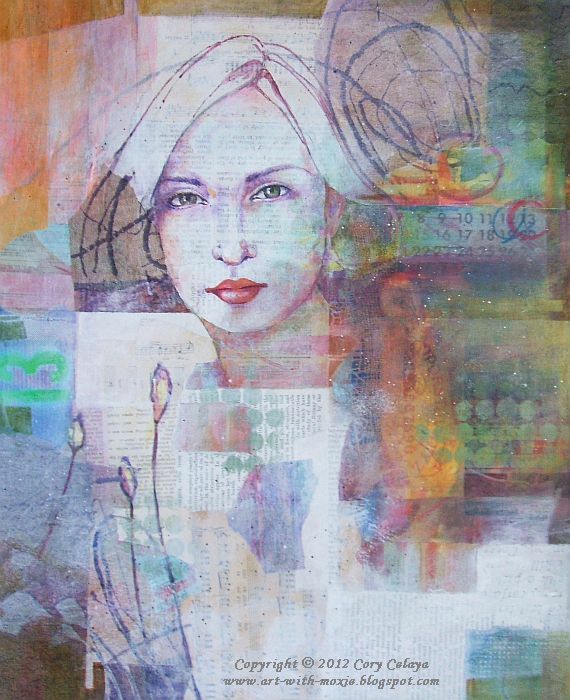 You will learn how to evaluate your works in progress, how to improve your work making it ready to show and sell. 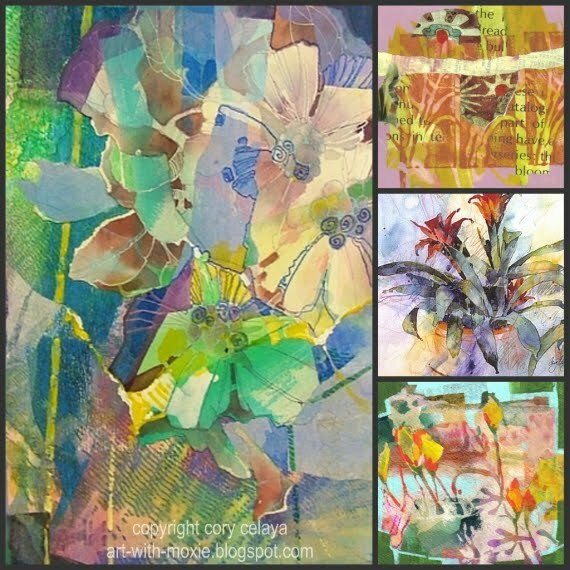 This is a great class for the novice artist as well as for the seasoned artist. I consider myself an eco friendly artist/teacher and will help you make great art using traditional and non traditional materials, keeping the cost of making art low. Yes, I am still busy making art jewelry to sell on vendor day at three teaching venues. Artiscape Ohio in April, Art Unraveled Arizona in August, and Art is You California in September. 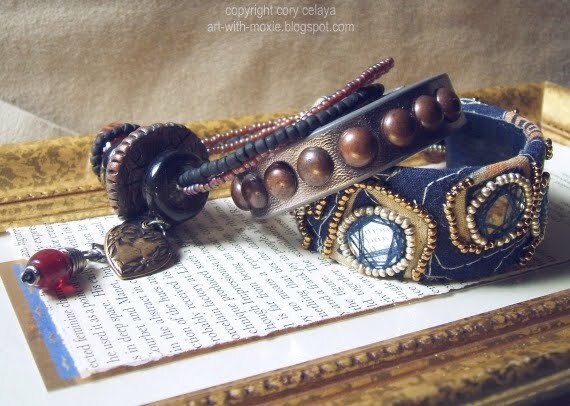 The triple stack in the photo consists of a beaded bracelet with handcrafted disk beads, a silvery taupe leather bracelet with brass studs, and a fabric cuff with abstract bead work. The cuff includes some shiny mirror like disks to catch the light. If you want to comment and have a problem, please email me. Comments are always welcome and appreciated. I would also like to thank Lori of Studio Waterstone for being so sweet in answering my questions. Please stop by her website if you want to see some gorgeous purses. 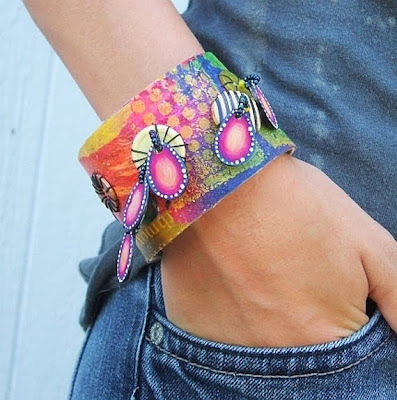 Lightweight, colorful and bold describes this fun to make cuff. One of several sample of what I do with paper leather that will be on hand to inspire you. 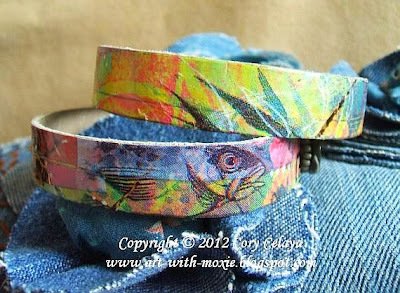 I will be teaching a class on how to make paper leather at Art Unraveled Phoenix, AZ August 2012. Click here to see other photos and class information. Inspire and copy mean two different things. These are the wonderful bead soup ingredients that my partner Rhea sent. 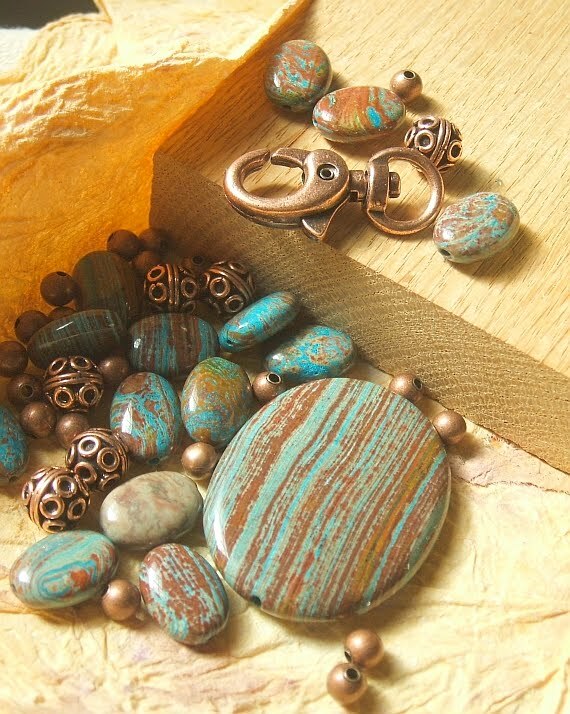 I love the dusty turquoise with the copper beads. I immediately knew what I wanted to do with the focal bead, and then...I discovered that the hole of the bead was closed in the middle of the bead. The bead reamer did not make a dent, so now I'm in for a real challenge. Think I will look at the beads for a while. some great photos of the beads I sent her. Thank you Lori for all the work you put into this wonderful project. Visit Lori's Site to meet the other participants. Lori... hope you are feeling better. I have been so busy making jewelry, I was excited when I found this weeks challenge on Inspiration Avenue. The challenge is Letters of the Alphabet. I love, love, love, using text in my mixed media work. Here is one of my many pieces of art work using text. The piece is titled Super Model...hope you like. the other entrant's blogs, you will like what you find. I will be teaching four classes plus one for the Trading Places event. Click here to see more class photos and here for retreat information and registration. See you in Ohio, stop by and say hello. I will be participating in the 5th BEAD SOUP PARTY... Whooo Hooo ! There will be 200 participants from all over the world. My partner this time around is Rhea Freitieg click her name to check out her blog. Lori really knows how to throw a party. It was a cold day in Paris... I found someone else he said, as he packed a bag and left me, leaving behind his favorite navy blazer and red silk tie. In anger and tears, I ripped the blazer to shreds, cut up the tie, and tore into the jewelry he had gifted me....Today I design artisan jewelry and accessories from those shreds of fabric, buttons off the blazer, and bits of broken jewelry. Every piece has a story...SWEET REVENGE !! !